Marlon Samuels crucial 85 not out and Brathwaite’s blistering 4 sixes in last over win’s West Indies their second World T20 title. 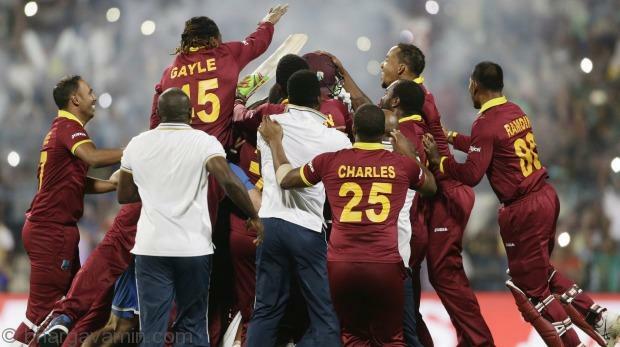 Eden Gardens and 49,818 fans saw The West Indies became the only squad so far to win the World Twenty20 title twice. West Indies scored 161 for six in 19.4 overs while in pursuit of England’s 155 for nine, Losing 11 for three with J.Charles, C.Gayle and L.Simmons back in pavilion, Samuels and Bravo added 75 runs off 69 balls, for the fourth-wicket, offering hope before the West Indies stumbled again. While batting first England did not got on to a good start by losing two quick wickets int this crisis situtation England need a partnership to steady the ship, Joe Root added 61 to the England total in partnership with Jos Buttler (36) got England to a par score. Samuel Badree and Dwayne Bravo were the star bowler for West Indies taking 5 crucial wicket. While bowling England struck early wickets, Joe Root who got two early wickets, who came on for the second over and dismissed Johnson Charles (1) and Chris Gayle (4), gave England hope and left the West Indies requiring 55 from the final four overs. Man-of-the-match Samuels scored a well-paced 85, the highest score in an international T20 final, but it was left to Brathwaite [35 not out] to power the West Indies to the title with some brutal hitting in the final over. “Firstly I want to thank the almighty,” Sammy said at the post-match presentation. “We have a pastor in the team in Andre Fletcher, we keep on praying. Really happy for this win, it’s something we’ll cherish for a long time. “We have a few match winners, nobody give us a chance, every game somebody stepped up – good to see Carlos play like that in his debut World Cup. Shows the T20 depth we have in the Caribbean, hopefully we will continue to improve. “People were wondering we would plays this tournament, we had issues with the board, Mark Nicholas called us players with no brain. But all of us came together, these 15 men put adversity aside, play this type of cricket in front of such passionate fans. It was tremendous. I personally feel that West Indies deserved to win, the courage and hardwork they have shown was tremendous, even facing so much problem before the start of the tournament they came up and proved a point to their critics. I congratulate West Indies men, women’s and U19 team on such an achievement this year. Keep smiling and Dancin…..! Champions! Here is the video of the trending song “Champions” sung by Dwayne Bravo. Champions!… Champions!!! West Indies are the Champions!